Bargain Bead Box is a monthly subscription promising over $40 worth of quality jewelry-making supplies every month. The Products: Designer quality beads in materials ranging from crystal to glass to semi-precious gemstones, plus metal beads and findings. Bargain Bead Box does not send any plastic beads or seed beads. There was a letter in the box with some more information on the theme (“Mystic”). The back contained a list of the month’s beads. There’s always a coupon for 30% off their retail website, too. These are pretty, but I decided to go with mostly blues and grays for my necklace this month, so I am saving these for a future project. I think they might look interesting with some of the etched Czech glass beads. You’ll get a lot of Chinese crystal with this subscription. It’s usually bicones, which are handy, but every once in a while you’ll get a different shape. I don’t think I’ve seen this shape before. I like the finish on these. Here is another interesting Chines crystal shape. I also love the color. This is a bit bolder than the muted look I was going for this month, but I do love these and they will definitely get used soon. You’ll usually receive a length of chain with Bargain Bead Box, in a color that coordinates with the other findings, charms, etc. from the box. The styles vary. It is usually plated steel so use some memory wire cutters or other heavy-duty wire cutters for it as it will mar most regular jewelry wire cutters. You’ll always get some clasps in a matching metal tone. I used one of these in my necklace this month, but this is a style that will match many different designs, so the other one will likely get used soon as well. Here are this month’s bicones. 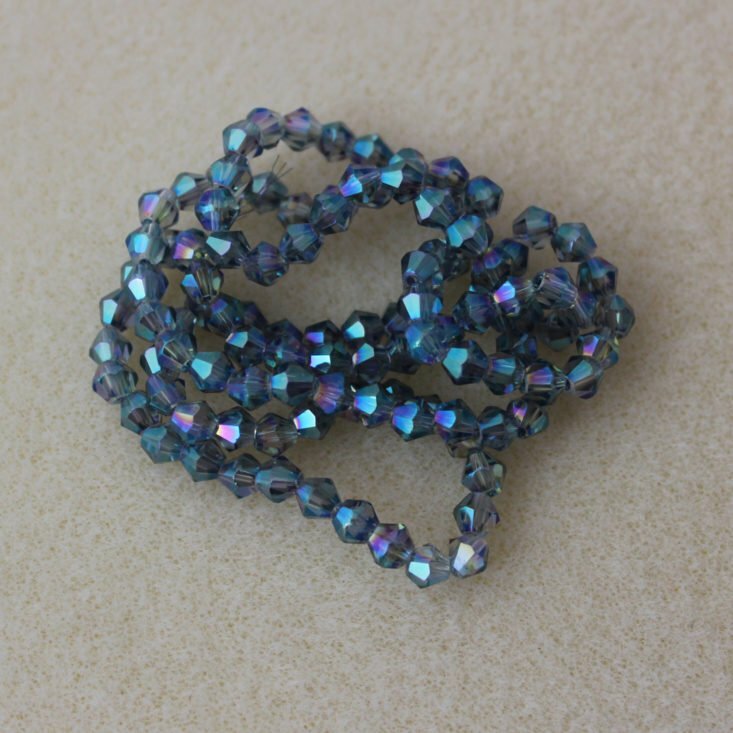 Sometimes I use these in right-angle weave or as a substitute for more expensive Swarovski or Preciosa bicones in a pattern, but this month I used them in a knotted design. I don’t really have much in the way of crystal point jewelry so I wanted to challenge myself to use one of these, this month. You can see the result below. There are usually several centerpiece options; I’d consider the crystal points one of them but there was this flower, as well. Sometimes they are quite large but I thought the size of this was all right for my purposes so I incorporated it into my necklace as well. I think these are cool, but I didn’t use them this month because I noticed when I took them out of the baggie to photograph, that the inside of the baggie was all marked up, so I think the finish isn’t very permanent. I need to look into some kind of fixative to apply to these before using them, so they don’t stain my clothes or skin. These would be good for a simple bracelet but are also small enough to use in earrings. Really, there are a lot of options here. I was going for a mostly organic type of design so I didn’t use many metal accents, but you always have a lot of options with this subscription, and if you like using lots of metal, it is definitely something you can do. I am a fan of rondelles and used many of these in my necklace this month. They had a nice, muted, soft look to them that worked well with what I wanted to do. I used some of these in my necklace, as well. They were the right size and I liked the visual contrast they presented next to the faceted bicones and rondelles. I have a lot left and 4mm is a good size for use in beadweaving patterns. I love these but I haven’t quite figured out how I want to use them yet. But I have a thing for fancy teardrops like this and they are definitely in the back of my mind now. Here is a necklace I made this month using three of the bead types, the clasps, a gemstone point pendant, and the flower filigree pendant/connector from this box. The only things from my stash are the silk thread and a single silvertone bail for the flower. I haven’t knotted between beads for a while and apparently, I’m not very good at it anymore as these knots are not snug and tight next to the beads the way I used to be able to do. I have a knotting device I need to learn to use that may help me with this some. Verdict: I did not calculate a value for Bargain Bead Box, as explained above. The information sheet gives a retail value of about $53 and I can believe that value if you were to go out looking for similar beads to purchase individually. There is definitely enough here to make several pieces of jewelry, too. Looking at it another way, you are paying just over $1 per item since the price is $15.95 and there were 15 items this month. And THAT is a pretty good deal. Please note that no directions are given and you have to supply your own needles, stringing materials, tools, etc. Can you still get this box if you sign up today? No, you would receive the October 2018 box as your first one, although they do sometimes offer past boxes on their site, and individual items can sometimes be purchased from Bead Box Bargains. Value Breakdown: This box costs $15.95 + free shipping, which means that each of the 15 items in the box has an average cost of $1.06. Check out all of our Bargain Bead Box reviews the Craft Subscription Box Directory for more great beading, craft supply, and DIY project boxes! What did you think of the September 2018 Bargain Bead Box? Do you subscribe to any beading or craft boxes? How do subscribers rate Bargain Bead Box? Do you subscribe to Bargain Bead Box? Add your rating now! I always love your reviews and look forward to seeing what beautiful creations you do with the bead subscriptions. I would love to see what you create with the beads you are saving until a future project (ecspecially those first agate beads). I am going to check this out. Looking at the materials, I had nothing like your piece envisioned. I love what you did and wish I could get the September box still. I would like to steal your design idea. I have some similar beads already and can duplicate the idea. Do you have a code I can use to give you credit if I subscribe? As they may have some of this month’s beads in the shop if there was something in particular you liked. Thanks for your review. Love this month’s “box” and your creativity!